Beta readers are an author’s best friend. They provide an invaluable service to authors and are the unsung heroes in the publishing world. A good beta reader will help you see your story with fresh eyes and take it to the next level. I recommend having as many beta readers as possible, for a few reasons. Each reader is different and likes (or dislikes) certain things. Each reader also has a different set of personal experiences and beliefs that affect their reading, which can help you in different ways. People also have different reading styles and different levels of critical reading. You also have to take into account that not everyone will come through for you (more on that later), so by having multiple beta readers, you can ensure that in the end, you’re getting a decent amount of feedback. Here’s why you need beta readers, how to find them, what you can/should expect from them, and everything else you need to know about them. First, I recommend sending your manuscript in a Word document and suggesting people use the Track Changes feature. This makes it easy to see where they’ve written in suggestions, crossed out or added words or punctuation, or made any other changes or comments within the document. I’ve also had readers do general notes in a separate document, which is fine. Each reader has a different style, and since many people have never beta read before, it’s important to tell them from the beginning what you expect. There are general things - did they like the story, did it flow, did they like the characters, were there any gaping plot holes - and then there are more specific things that will depend largely on your own strengths and weaknesses as a writer. For example, do you know your dialogue could use some work? Ask betas to pay close attention to your dialogue and make suggestions. Are you writing a romantic comedy but aren’t sure it’s funny enough? Your beta readers are the perfect people to help you figure that out. I always tell my beta readers to be brutally honest with me. Be kind, but don’t sugarcoat things - if something needs work, tell me. When I beta read for someone, I go deep, and I love beta readers who do the same. I fix small things like punctuation and spelling (you can assume these errors will get fixed in further edits, but sometimes small things get missed), point out where grammar or flow isn't quite up to snuff, add in notes about what made me laugh, or made me cheer for the main character, or what evoked emotion. I also point out anything that doesn’t make sense, jokes that fall flat, dialogue that feels unnatural, wording that’s too formal (or too informal), etc. Who should beta read for you? -Readers, especially readers in your target audience. You want readers who are passionate about books and who have a good understanding of how stories and dialogue should flow. You especially want people who are well-read in your genre; being well-read in general is great, but if you’re writing fantasy and you have a beta reader who reads everything but fantasy, they might miss some important details. -Other writers. The majority of my beta readers are fellow writers. They tend to understand what you’re looking for when it comes to a beta reader, plus they have an understanding of story structure, character development, dialogue, etc. They’re likely to have a more critical eye, and as storytellers themselves, they’ll be able to help you fix the parts of your story that might be lacking. -Friends. It’s okay to have friends beta read for you, but don’t rely on them solely. People who are close to you will often tell you what you want to hear because they’re afraid of hurting your feelings. You want readers who are going to provide constructive criticism and tell you what they liked and why, and also what they didn’t like and why. This isn’t to say friends can’t give constructive feedback; I’ve had friends who have read my manuscripts and pointed out things I missed entirely or areas the story could be stronger. -If you have people in mind, ask them. Make sure they know there’s no pressure to say yes, but you’d value their opinions and feedback. -Set up an exchange system with writer friends. I have two author friends I know I can count on to beta read for me, and they know I’m always available to beta for them in return. -Use social media to your advantage. Sometimes, if you’re talking about writing or editing, someone will offer their services if you need an extra set of eyes. You can also put out a call on Twitter, Facebook, Instagram, your blog, etc. For example, you could tweet that you’re looking for people to beta read your 70,000-word contemporary romance within the next three weeks. If you’re worried about random people reading your work, or you’re afraid to hurt someone’s feelings by turning them down, the best thing to do is create a sign-up form on Google for people to input their information - name, email, have they beta read before, do they have a blog, etc., and be clear that not necessarily everyone will be chosen, but you appreciate every single person who shows interest. This way, you can be selective about who you choose, and pick people you feel are the best fit. -Ask other writers where they get their beta readers. Some of them will be happy to pass your information along to their own betas or tell you about groups they belong to that do exchanges or where you can add your book and people can sign up to beta read. 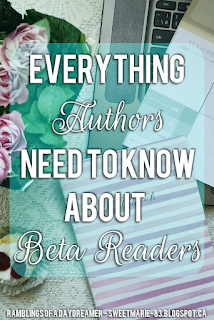 Should you pay for a beta reader? I’ve never paid for a beta reader, nor would I, but that’s a personal choice. There are bloggers and other people who charge for beta reading, and while I admire their entrepreneurial spirit and think it’s a great way for them to make money if they can get paying clients, there are plenty of people who will do it for free, knowing they’re helping an author make their work better. 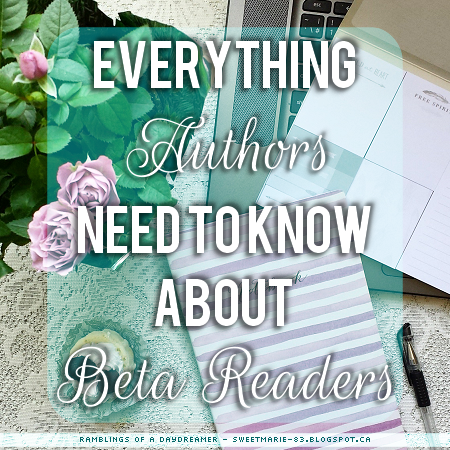 When do you use a beta reader? Typically a manuscript is sent to beta readers after you’ve done at least one round of in-depth editing. By in-depth, I mean going beyond just fixing spelling and grammar errors. I fill in anything that got left out during the first draft, work on dialogue, make sure my timeline is correct (something I still struggle with five years into my career), cut unnecessary scenes, and generally tighten the writing wherever possible. Then I send the MS to my alpha reader. Do you need an alpha reader? No. I’m incredibly lucky to have one, and to have had the same one through my entire publishing journey. She reads my writing before anyone else and gives me feedback; once she’s done, I go through the manuscript again, make any changes she’s suggested, and then I send it off to my beta readers. How much time should you give beta readers? I’ve given my readers and been given as a reader anywhere from one week to an entire month. This varies depending on a number of factors. -How long is your manuscript? Is it a novella that someone could read in one or two sittings? Is it an average-length contemporary romance? Is it an 800-page epic fantasy? -When is your deadline? Is your book not publishing for another three months? Or are you pressed for time and your publication date is looming? -What time of year is it? If you’re expecting beta readers to read your manuscript in, say, December, people are typically busy with holidays, travelling, etc., so that needs to be taken into account. -Not everyone who agrees/offers to beta read for you will come through. This was a lesson I had to learn the hard way. I took it really personally my first few books until I learned it’s just a fact of life for writers. Some people have the best intentions, but life gets in the way. Some people get excited at the prospect of reading a book before the general public (especially a free book), but don’t actually follow through. And some people agree because they think they should, but may or may not have any intention of actually following through. I’ve had all three of these things happen. After awhile, you develop a good sense of who will and won’t come through for you, and you become a bit more selective. It’s perfectly acceptable to check in with people and see how the reading is going in case they’ve forgotten or aren’t going to get to it at all or won’t finish on time. -Some people will give more detailed notes than others. I love thorough notes and I give thorough notes, but not everyone does. For every person who makes comments throughout the entire document, you’ll likely get two or three people who just write a few lines saying they liked the story, liked the characters, thought X could be worked on more, and that’s it. That’s why I always recommend having as many beta readers as possible, especially when you're just starting out and your writing likely needs more work. -Not everyone is going to like your book. Some people might have issues, or they might not connect with your story or characters. Don’t take it personally. This is a fact of life for writers and the sooner you accept it, the easier your life will be. -Something important to remember is that ultimately, it’s your story. You don’t have to make changes. Take what works for you and scrap what doesn’t, but be open to your readers’ feedback. Sometimes I haven’t initially agreed with something a beta reader has suggested, but after thinking about it for awhile I realized they were right. Other times, I immediately agree with them and go with their suggestion. And other times, I know a suggestion would be completely wrong for my story, and I leave it as is. Just remember your beta readers have the best intentions and want to help you make your book the best it can be. -Beta readers are not the same thing as editors. I can’t stress this enough. It’s important to hire an editor. I had a writer friend who was adamant about not needing an editor for her first self-published book, especially because I’m thorough in my beta reading and fixed a lot of spelling and grammar errors. I tried to convince her to get an editor, but she refused. One of the most common complaints reviewers had? That the book was in serious need of a good editing. Some readers don’t care about things like that, but others are picky and it affects their overall enjoyment of a book. I’ve seen readers dock an entire star or even two over a lack of editing. Don’t let this happen to you! If you’re writing a novel, it’s never too soon to think about beta readers. Start putting out feelers among your friends, readers, and fellow writers. Compile a list of people who are interested in reading for you and keep them updated on your writing and when you’ll need their services. 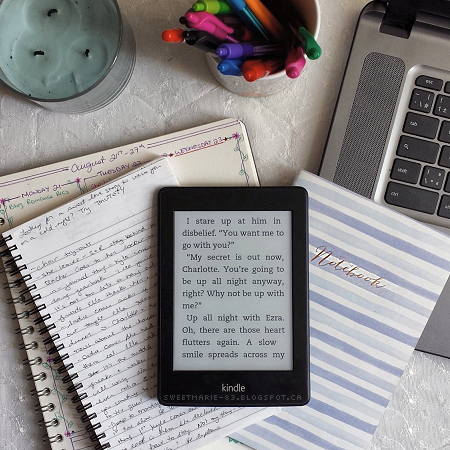 Beta reading is a big responsibility, so be sure to show your gratitude and show your readers how much you appreciate the time and effort they put into reading your book and providing feedback. Have I missed anything? Do you have questions? Let me know in the comments, or feel free to email or tweet me! The point about it being your story is important. I've had beta readers give suggestions that I didn't agree with, but made me realize that the scene in question did need something done to it and I end up changing it.